This seems to be one of the most talked about breads from The Bread Baker’s Apprentice and I’ve been looking forward to giving it a try since first starting the challenge. While I’ve read plenty of rave reviews of this bread over the years, I was attracted to pain à l’ancienne for a couple of other reasons. 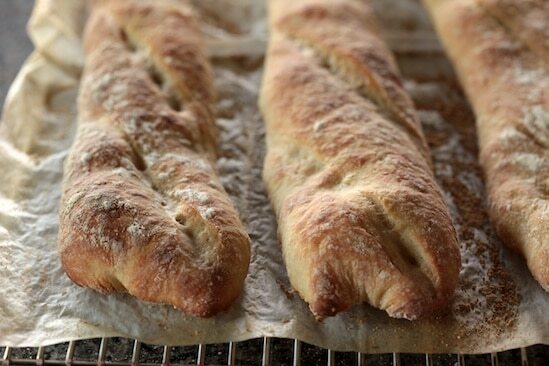 First, the photo of rustic-looking baguettes in the book is beautiful and I’ve always wanted to make bread that looks like that. But I was also very intrigued by the method. 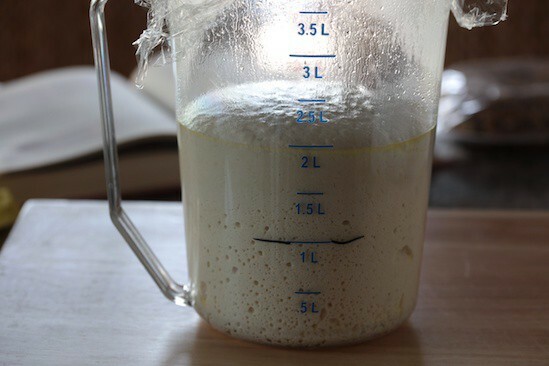 Peter Reinhart teaches us about the delayed-fermentation method with this bread, manipulating temperature to delay the activation of the yeast, which in turn allows more sugar to be released from the starch. This results in a bread with more flavor and a crust with more color, without the addition of extra ingredients. According to Peter Reinhart, the delayed-fermentation method evoked a fullness of flavor from the wheat beyond any other fermentation method he had encountered up to the point of publishing this book, in 2001. Have I confused you yet? It turns out that once you get past all the scientific explanations, this is one of the easiest breads in the book to make. When I say that we manipulate temperature in this bread formula, it just means that we start with ice cold water instead of warm or room temperature water like most of the previous breads in the book. Keeping the dough cold and fermenting it in the refrigerator is what delays the activation of the yeast. The day before you want to bake the bread, mix up a simple dough of bread flour, salt, instant yeast, and ice cold water. 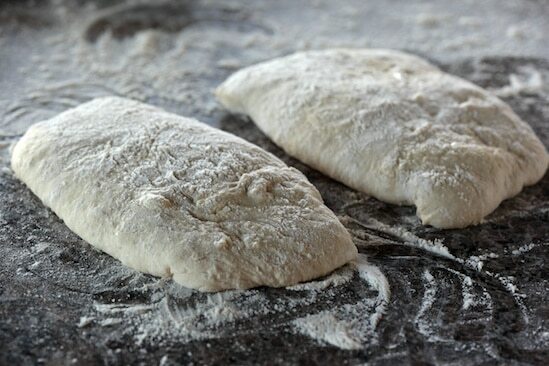 It’s a wet dough, similar to ciabatta, so it’s easiest to mix and knead it in a stand mixer. Once the dough is mixed and kneaded, transfer it to an oiled container, mist the top with spray oil, cover it, and immediately place it in the refrigerator. 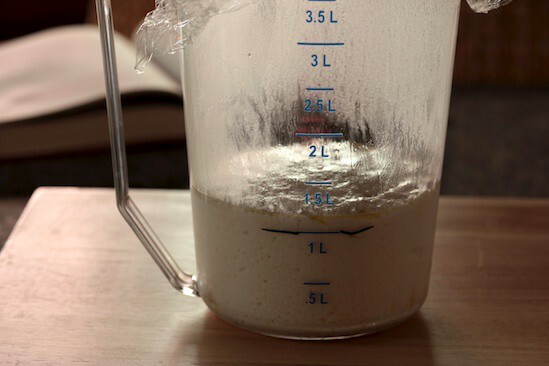 The dough might rise a bit in the refrigerator overnight, but won’t come anywhere close to doubling in size if you started with cold enough water. 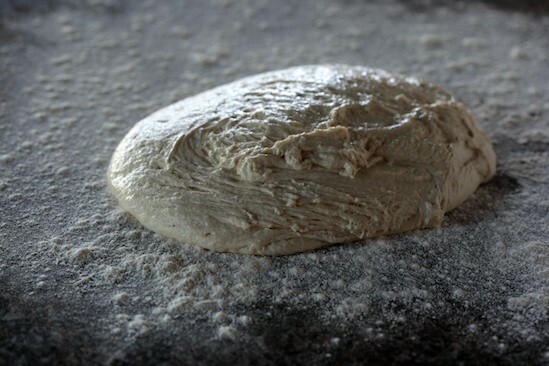 The above photo shows my dough as soon as I took it out of the refrigerator in the morning. The black line on the pitcher indicates the dough level from the night before. After removing it from the fridge, let the dough sit out at room temperature where it will gradually warm up, wake up, and start to rise. Allow it to double in size. My dough took about 5 hours to double from its original size, but my kitchen wasn’t very warm that morning. As soon as it has doubled, liberally sprinkle the counter with flour then gently remove the dough from the proofing container. 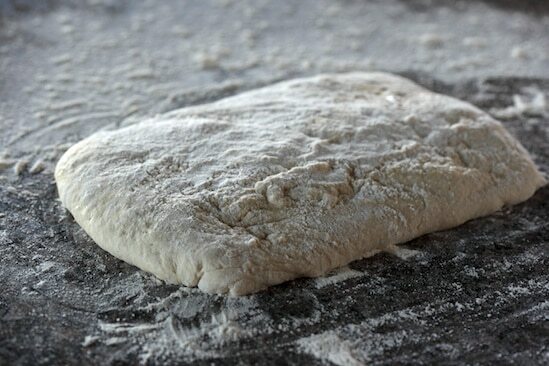 You want to deflate the dough as little as possible when you’re dumping it onto the counter. The dough will probably be very wet, so dust it and your hands with flour. 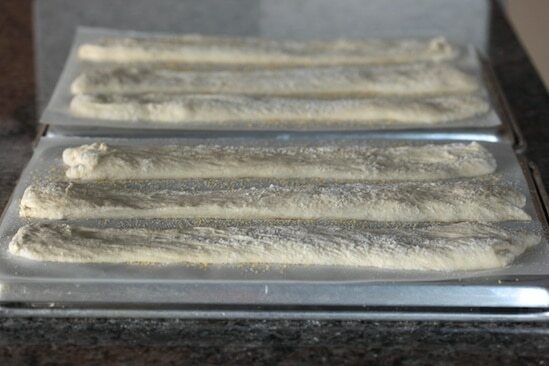 Gently stretch the dough into an oblong, about eight inches long and six inches wide, making sure to keep flour under the dough so it doesn’t stick to the counter. Using a bench scraper that has been dipped in water, divide the dough width-wise. The water prevents the blade from sticking to the dough. 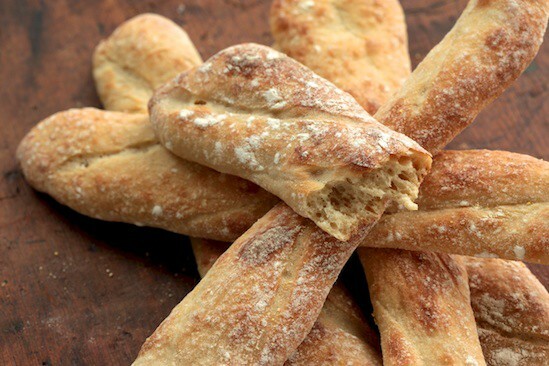 Continue dipping in water between cuts until you have completely divided the dough. Let the pieces rest for 5 minutes. Meanwhile, preheat the oven with a baking stone and steam pan inside. 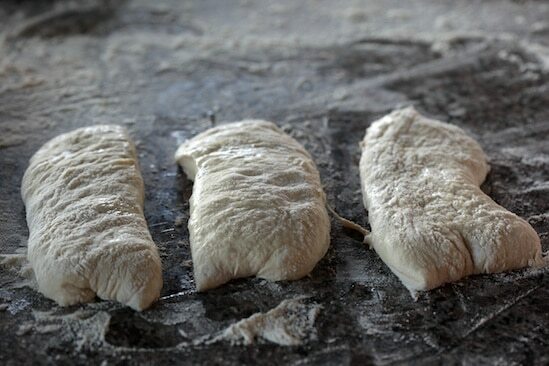 Next, using the same cutting method, divide one half of the dough into three equal pieces. Repeat with the other half. You should end up with six short lengths of dough. Cover the backsides of two half sheet pans with parchment paper. Sprinkle the parchment with semolina flour or cornmeal. 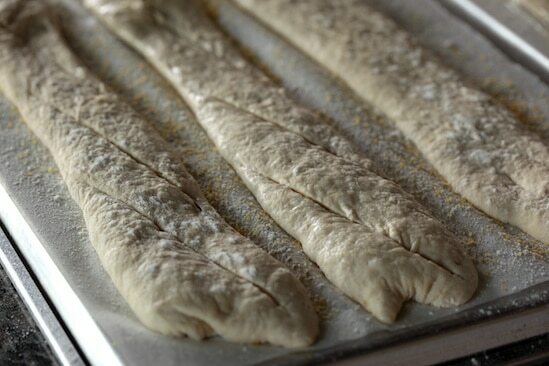 Now flour your hands and gently stretch each piece of dough to the length of the sheet pan. Each pan will hold three strips. Although it wasn’t specified in the book, I dusted the loaves lightly with flour after stretching them, mainly for decoration. Unlike most of the breads we’ve done so far, these loaves don’t have to proof before baking. Mine sat for a while because the oven wasn’t quite ready, but not long enough to double in size. They are ready to go as soon as your oven is ready. Right before baking, they can be scored. Because this is such a wet dough, slashing the tops of the loaves can be a bit tricky. I used a very sharp serrated bread knife instead of a razor and I tried to score them as if for a baguette. They weren’t perfect, but I wasn’t worried about it since these loaves are supposed to have a very rustic look. As soon as they are scored, it’s time to bake. You can either slide the loaves, parchment and all, directly onto the baking stone or bake them on the sheet pan. I chose to bake the loaves directly on the stone. You can only bake three loaves at once, so just let the others ones wait their turn. Or, you can spray them with oil, cover with plastic, and refrigerate them for up to a day before baking. The delayed-fermentation method seemed to have worked because the pain à l’ancienne baguettes did have more color than the French baguettes. The bread also had good flavor. It was quite delicious, actually. I must say that I prefer the flavor of the French bread to this one, but this was so easy, I’ll probably make it more often. However, I’ll definitely be revisiting both breads in the future. If you’re following along in the challenge, the formula can be found on page 191 of The Bread Baker’s Apprentice. The next bread I’ll be baking is Pain de Campagne, a French bread with a country-style crust. I’m looking forward to Pain de Campagne because I’ll be trying out some new shaping techniques! Great step-by-step post! Maybe since I'm off for the summer, I'll try a few of these breads! Really great photography and step-by-step breakdown. All you need now is a Madden-esque tele-strator!! I love making these delayed fermentation breads. We have fresh bread almost every night now because of them. 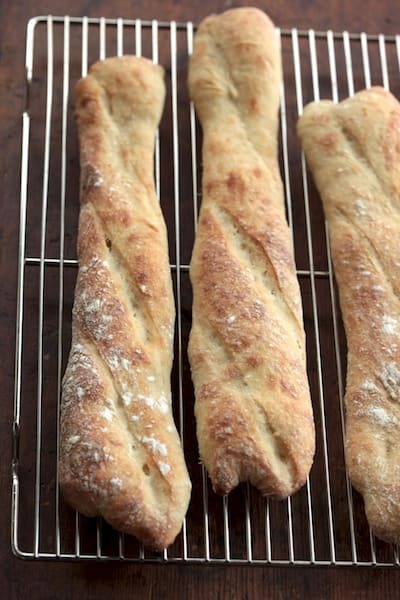 I like this method for baguettes - I will have to try it! Your photos are so nice. Wow. Your crumb on those looks really perfect. I've kind of been avoiding trying these, but I'm not sure that I can wait much longer. Great photos as always Nicole! This was probably my favourite bread from that book so far. It has such a different flavour! Wow Nicole, you got great holes in your crumb!! Beautiful! 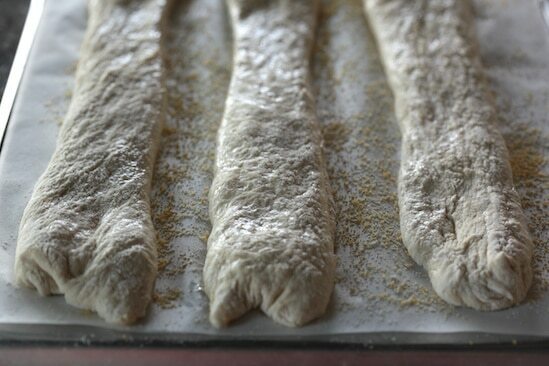 I adore bread-making and these photos are making me giddy, especially the one with all of the holes. :) You did a great job. I also bake from the same book pretty often. Thanks for sharing! . . . If you have the chance, I've started a new blog and I'd really love your comments/ thoughts. Thank you. There's something about having your own bread that you produced with your very own hands... I made homemade German pretzels this past weekend and it was my favorite thing that I'd ever made. Not necessarily because of the taste, though they were delicious... it was just very satisfying. I have not been very good about posting my breads and I have not made this one yet... so I am making it tomorrow. This really looks lovely. Thanks Nicole! Oh man! This looks delicious. I want to make bread like this. Beautiful photos! 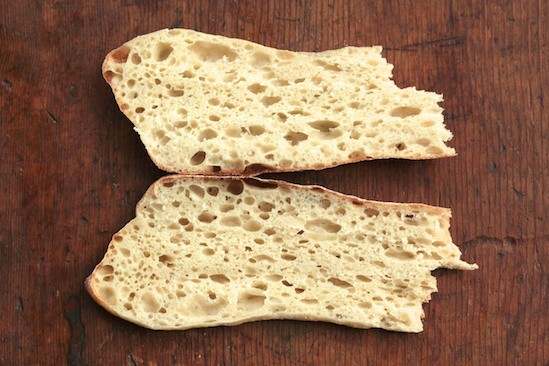 This is one of my favorite breads - the method in Peter's new book, Artisan Breads Everyday gives all of the flavor and half the work of this recipe! My class made it and most said it was their favorite bread ever! I am making these now... yours look great. I did put my parchment paper on my pizza peel to make it easier to get the loaves on the pizza stone. As usual, amazing photography. And beautiful bread. I love the holes! I generally get great flavor by leaving this bread in the fridge for three days. i think the longer time develops the flavor further. On the day I'm going to bake it, I take it out at six in the morning, and have it in the oven by eight- even though the dough is still cold. When it comes out, it's completely baked through, and piping hot. The flavor is amazing. This is the first bread I made from the book, and one of the main reasons I joined the Challenge!